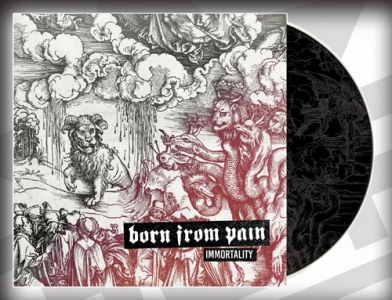 "Born From Pain's debut "Immortality" available as 12" etched LP. Special limited edition for Born From Pain's 20th anniversary. Featuring the 5 original Immortality songs for the first time ever on vinyl. Incl. download card for the 5 Immortality songs + 2 bonus songs as featured on the GSR re-release in 2000. Immortality was originally released in 1999 on UK's Contrition Records, and re-released in 2000 on GSR Music."